Set of basalt stones for stone therapy UMS-64TC2, buy for 185 in Europe. Excellent set for your beauty salon. Moreover, even if you are a beginner expert, this set will help you to provide the customer with a pleasant and delicate stone therapy procedure. 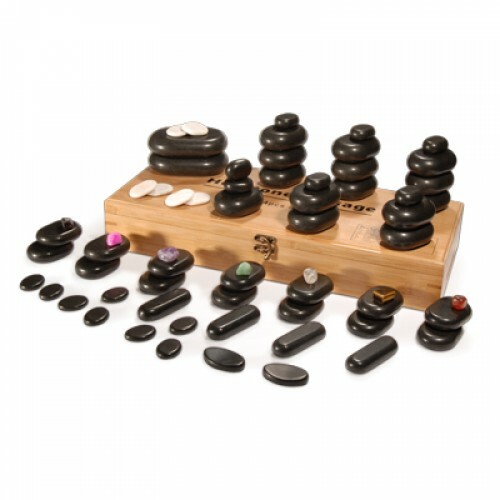 The set of diverse stones for massage Deluxe 64 Pcs UMS-64TC2 includes a variety of stones, which can be used anywhere on the body, from the eye to ending of feet. These stones are durable and practical, of the highest quality, packaged in a special bamboo box. Therefore, each stone has its own place and it is convenient to store a set. It does not take a lot of space in your office for the procedures.